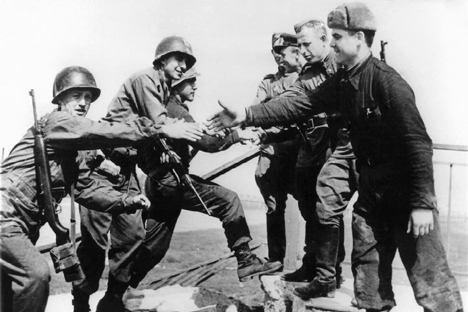 American (left) and Russian soldiers shake hands on April 24, 1945 at the destroyed bridge over river Elbe as both troops meet at Torgau, Germany. The Elbe River Memorial is being erected 71 years after the famous rendezvous of U.S. forces coming from the West and Soviet troops advancing from the East effectively cut Nazi Germany into two. In a matter of weeks Berlin had fallen, Adolf Hitler was dead and the war in Europe was effectively over. “I see this memorial not only as a tribute to our joint victory in World War II, but something to cause both Americans and Russians to take a pause for reflection and realize that we are on a dangerous and previously unthinkable road to World War III,” said Edward Lozansky, founder and president of the American University in Moscow and a prime mover behind the memorial. The Elbe memorial is the work of Russian sculptor Alexander Burganov, whose statues are displayed in many cities and museums around the world, including Washington, D.C., where his statue of great Russian poet Alexander Pushkin can be found on the campus of George Washington University. The ceremony starts at 11.30 a.m. The event is open to the public.